The LG 55LW5600 is a great alternative for those who don’t want to drop a bundle on 3D HDTVs using active shutter glasses. LG LW5600 series information: The review of LG’s 55-inch 55LW5600 is based on our experience with the 47-inch 47LW5600 TV. According to LG, the two televisions have identical specifications (excepting for dimensions and weight) and performance should be similar. A new generation of less-expensive 3D HDTVs has just hit the market. Are they worth the lowered price of admission? On the surface, the 47-inch LG 55LW5600 is just one of a sea of black-edged flat panel HDTVs, but it does have a nice translucent edging. The screen is framed by a fairly wide black bezel, so it doesn’t have that “floating pane of glass” look of higher-priced sets; still the overall design is more than acceptable. Along the lower bezel is the 3D emitter, touch buttons for controls you’ll never use, as well as remote control and intelligent auto light sensors. There are down-firing stereo speakers at the bottom of the panel rated 10 watts apiece, but it lacks the subwoofer you can find in more expensive models. As always, any big-screen flat panel deserves a sound bar at the very least in our book. 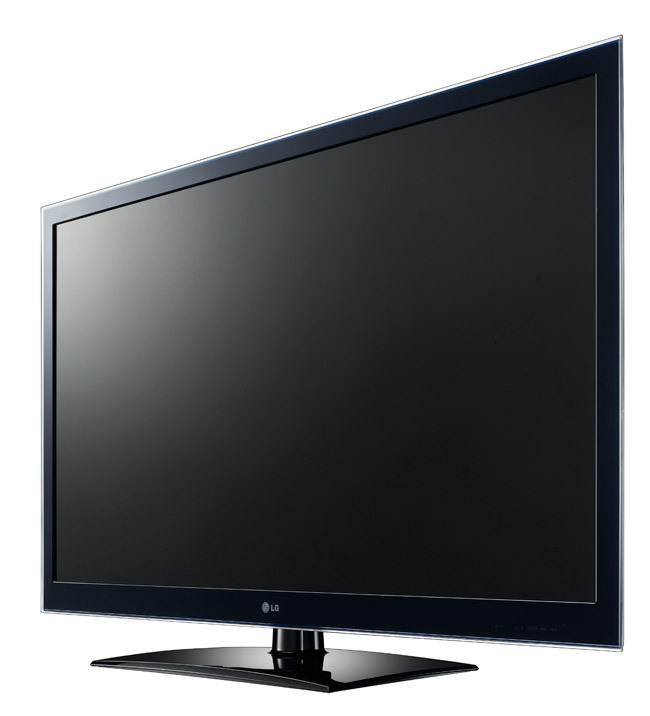 The LG HDTV measures 43.9 x 26.9 x 1.2 (W x H x D, in inches) and weighs 40.8 pounds (45.6 with the stand). On the left side is a jack pack offering two USB inputs (one for the supplied wireless LAN adaptor) and four HDMI inputs. The rear has component, A/V, RS-232C, RGB-in, Ethernet and other connections — it should handle all your gear with few problems. We just wish there were an SD card slot to handle stills and videos. You get the panel, swivel stand and the eight phillips screws to put them together. We were rather surprised at how lightweight the stand is, but as long as it meets safety standards, no harm, no foul. The set comes with four pair of 3D glasses — count ‘em, four — a wireless network adaptor and two remotes: a backlit candy-bar style and the Magic Motion Remote control with strap that looks like a game controller. You also get a 36-page printed owner’s manual as well as a CD-ROM with the full 114-page guide for this model and about 30 other LG sets. We know companies want to save money and trees, but this arrangement is way too confusing. There’s also another disc with Nero MediaHome 4 Essentials for connecting to a DLNA home server, as well as a screen cleaning cloth. For some reason, LG includes composite and component gender cables when even a one-meter HDMI would be more welcome. Once assembled, we connected a rather slow LG BD670 3D BD player ($249) and a Verizon FiOS cable box to the HDTV, then began watching Avatar and Alice in 3D for what seemed like the 10,000th time.